Wherever you see the Blackboard Text Editor, you can add media using the Mashup button in the Text Editor. If you would like to reuse a video that you have previously posted or one that you’ve uploaded from CaptureSpace, can do this very easily. There’s no need to re-record or re-upload your video. The Mashups button is located in the third row of icons in the Blackboard text editor. The first time you go to use Mashup tool, you will likelyneed to click the "Show More" button on the top right to provide the Mashup option. If you do not see the Blackboard text area which contains the Mashup tool, you may need to click the Write Submission button. This applies to Assignment submissions only (not Discussions). 1. From the Mashup Tool, choose Kaltura Media. 2. 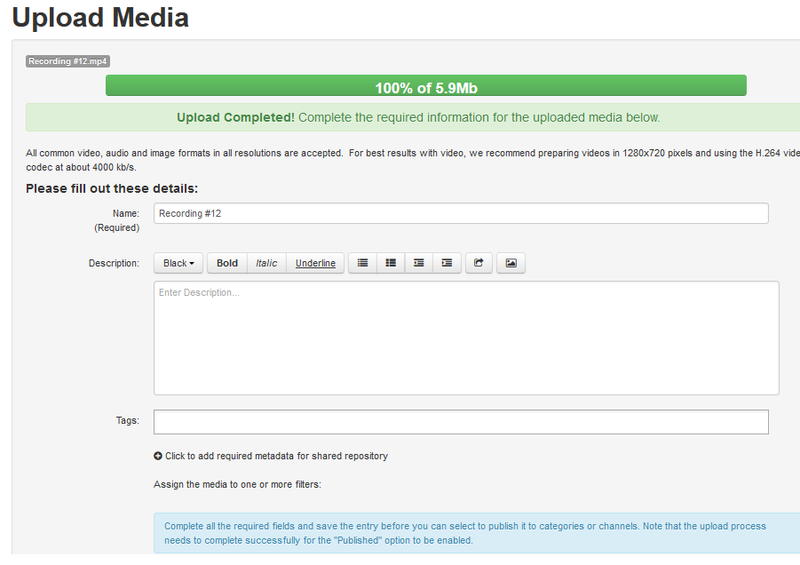 The My Media page will appear with all of the videos you have previously uploaded to Blackboard. Click the Select button that corresponds to the video you want to place into your post. 3. Your video will then be placed in the Blackboard text editor when you can add additional supporting text or files. If you need to add additional videos to the post you’ve already started, repeat the previous steps by accessing the Mashups menu and selecting the Kaltura Media option. Once you are finished with your post, click the Submit button. 4. A transcript of your video should be attached by clicking on the Browse My Computer button and selecting the appropriate file. To ensure that everyone regardless of any disability is able to review your video submissions, be sure to create a transcript of your video and saving it to your computer. Upload the transcript of your video to your post using the Browse My Computer button in the Attachments area below your post or assignment (prior to submitting it). 1. Record your video. Refer to these video recording tips. 2. Move the video from the recording device to your computer (typically via a USB cable). Following the instructions provided by the camera manufacturer. Note where you save the video on your computer. 3. Access the MyMedia module on your Blackboard home page and click the Add New button. Then click on Media Upload option. 4. Click on the “Choose a file to Upload” button. 5. Browse your computer for the desired file, select it and then click the Open button. All commonly used file formats will be accepted. Remember to keep files as small as possible to increase the likelihood of a successful upload. Refer to the “Reducing the File Size of your Videos” document that you have been provided for detailed instruction on how to make the files smaller if necessary. Upload time will depend on the size of your file and the speed of your internet connection. 6. Once the video has been uploaded, you can edit the name and add a description or tags. The name of the entry will default to the file name but you will likely need to change it to something more descriptive. 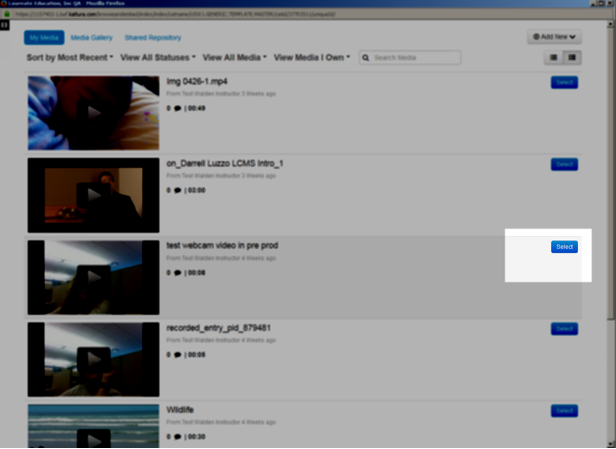 Tags are one word or short descriptions of your video that will allow you to easily locate your video later on. Tags are optional but recommended. The Description is also optional but will provide viewers a preview of your video in textual form. Click the Save button and then click the “Go to My Media” link. To add an additional videos to your post (if your assignment requires multiple videos), repeat the steps above beginning with choosing the Mashup Tool and then choose the Kaltura Media option. Follow the appropriate steps for uploading a new video, creating a webcam video, or re-using an existing video. Note: You must add the additional videos to your post prior to submitting your post or assignment to your instructor. Once you click submit, you may no longer be able to make changes to your post or assignment.